BASEBALL　USA, July 15, TOKYO - Three pitchers combined to throw a three-hit shutout while TJ Friedl (Nevada) reached base four times and scored the game's only run as the USA Baseball Collegiate National Team picked up a 1-0 victory over Japan at historic Meiji Jingu Stadium on Friday. The win is Team USA's first of the series after dropping the first two contests by one run each. The U.S. will give the ball to right-hander Kyle Wright (Vanderbilt) in game four as it looks to even the series. The game will be played at Kusanagi Stadium in Shizuoka with first pitch set for 6:30 p.m. local time/5:30 a.m. ET on Saturday. Game five will be played in the same place the following day at 6 p.m. local/5 a.m. ET. Friday's game was a gem for anyone who enjoys pitching and defense as each squad provided plenty of both. For the U.S., Brendan McKay (Louisville) and Alex Lange (LSU) fired four shutout innings each before Tyler Johnson (South Carolina) pitched a scoreless ninth to earn his second save of the summer. Japan, meanwhile, utilized four pitchers who combined to strike out 16 batters in the contest while yielding just five hits. Two of those hits belonged to Friedl, the U.S. leadoff hitter, who reached base in four of his five plate appearances and filled up the box score with a pair of walks, two stolen bases and the game's only run. After laying down a perfect bunt for a base hit to open the top of the third, he promptly swiped second and came around to score when Jeren Kendall (Vanderbilt) roped an RBI double to left. That would be all Team USA would need with McKay, Lange and Johnson putting zeroes up in all nine innings. Japan did mount a bit of a threat in the bottom of the ninth when leadoff hitter Takuya Sato pulled a one-out double down the line in right but Johnson was able to get the next batter looking and Kendall made a nice play to run down a long flyball in deep center to seal the victory. "Another tremendous baseball game. I'm a fan of baseball and all three games have been tremendous games with great pitching and defense. It is a little bit like watching a softball game back in the old days without a whole lot of offense but I think you have to tip your cap to the quality of the Japanese pitchers and American pitchers. It has come down to basically one thing to determine win or lose in each game. Unfortunately in the first two games we came up short but we were fortunate to make a tremendous play there in the ninth inning and find a way to win this one." "These are two great baseball teams. 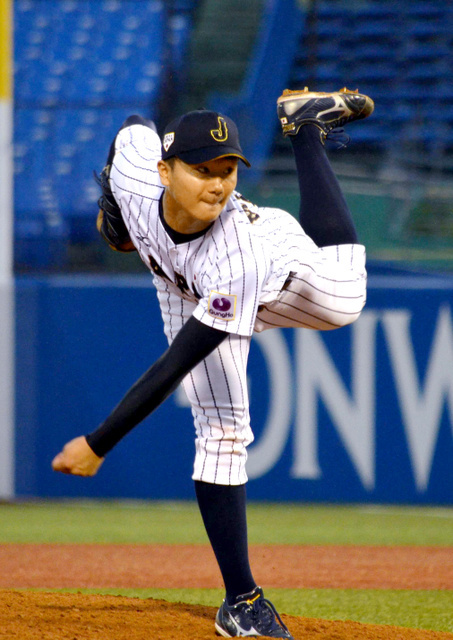 I am very impressed with the Japanese team, especially its pitching and defense. To have 16 strikeouts today against some very good hitters just shows that they are making really good pitches. Our pitchers are going toe-to-toe against them though. TJ (Friedl) had four good at-bats today and (Evan) Skoug had three good at-bats. We need to try to put together more of those but the quality of pitching has made that very difficult to do so far. We have our work cut out for us but we are looking forward to the game tomorrow. I'm sure it will be another quality baseball game." "Today was a tremendous game for our defense. They made big plays in big situations to help our pitchers out and the offense was able to do just enough today. My hat is off to the Japanese team, it played a great game but it feels good to get that first win out of the way." "The Japanese hitters take a lot of good at-bats. They foul off a lot of pitches that back home we would swings and misses on. They are tough outs in the box and I think it speaks for itself what its pitching staff has been able to accomplish so far. We are just trying to match them and hold them to as few runs as possible." "It feels great to get that first win. It was a great team win for us after a couple of tough losses in the first two games so feels good to get that first win under our belt. The Japanese pitching has been really good, a lot of good pitches and a lot of guys who can throw any pitch in any count they want to. All three games have been a lot of fun to be a part of."